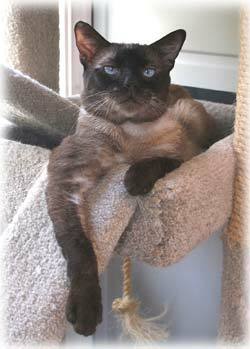 SO YOU THINK YOU WANT TO RESCUE A SIAMESE CAT? You had one as a child, you have a neighbor who has one, you've heard good things about them, you want to do a 'good deed'.... Then please read this. The Siamese personality is different from other cats in several ways. Siamese are very attached to humans. In ways they are more like a dog or an infant, in that they need much more attention than one would expect. They really require daily individualized personal time with you. They will follow you around the house, play games with you, and demand your company and attention when they want it. Unlike dogs, however ,there is often a probationary period before they give you their total trust. They are also highly intelligent. Because of this trait, without the personalized attention and some training they can get themselves into all kinds of trouble. They can go where they are not supposed to, open things that they shouldn't, be in places you don't want them to be - they can constantly be on the lookout for stimulation and if it's not provided they can make their own. The voice itself is very different from other breeds, and can vary from a plaintive mew to a loud yowl. They are often mistaken for crying babies. The intensity of the vocalization should not be prolonged if you are smart enough to understand what they want. Most of the time they talk at conversational levels. Please read the following short piece about "What is a Rescue Cat" to better understand what a Rescue cat is. If you feel you are ready to adopt a Rescue Siamese, we would love to consider your home as a permanent placement for one of our many, loving cats. However, as I'm sure you can understand, temporary placements can be stressful on all involved, and are certainly not beneficial to the cat; therefore we are making every effort to make sure you are completely prepared for your new family member. We think Siamese are the Best! We hope you will too! Each Center has slightly different Policies, so please make sure you look at each Center's Adoption Policies. You will find them on the following pages when you select a Center.